The Symposium programme includes oral paper presentations from PhD students with prizes funded by a bequest from Sir Bernard and administered by Engineers Ireland. Up to 4 posters per institution from PhD students at any stage of their PhD study. Remember that the deadline for submitting the papers is 22nd March 2019. The symposium is intended to display leading edge research and development in Mechanical Engineering which is currently being undertaken at universities in Ireland. Only one student per university or IT may submit and present a paper. The student should be in Year 2 of their postgraduate research. Postgraduate students from Universities and ITs in Ireland can contribute up to four posters (from any year of their research). Name of the author, and the address of the department. Abstract (which should not exceed 250 words). Main body of the paper. This should not exceed 8 pages (including diagrams and references) or 5000 words. Please submit the file containing the paper to e.harkin-jones@ulster.ac.uk in the format detailed above. Submission of files in PDF format should be emailed to e.harkin-jones@ulster.ac.uk Remember that the deadline for submitting the posters is 22nd March 2019. The symposium is intended to display leading edge Research and Development in Mechanical Engineering which is currently being undertaken at Universities in Ireland. Only four students per University may submit and present a poster. Each student should have completed 1 year of postgraduate research in their institute. The name of the postgraduate student, their supervisor(s) and collaborator(s) should be clearly displayed. Electronic version. Participants should bring the printed poster in A1 format and will have an opportunity on the Wednesday morning to display the poster for the workshop. Each of the posters will be printed in the Proceedings and so an electronic version of each poster is required by 22nd March 2019. As you will also be presenting your poster in PowerPoint to the audience, please submit a Power Point file and a .pdf file of the poster to e.harkin-jones@ulster.ac.uk . The dimensions of the proceedings are 185x245mm (slightly larger than A5). Please bear this in mind when choosing the font sizes etc. 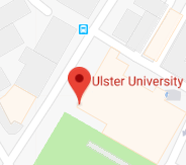 The conference will take place at Ulster University's Belfast campus. 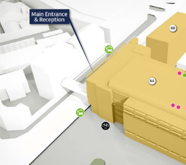 The conference venue, hotels and attractions in Belfast City Centre are only a 5-10 minute walk from each other. Belfast is easily accessible with a comprehensive rail and bus network and two airports. Taxis in the city are affordable (approximately £3 from Europa Bus Centre to the conference venue, £6 from Belfast City Airport to the conference venue). The Enterprise Train service (provided jointly by Translink and Irish Rail), from Dublin's Connolly Station to Lanyon Station (previously known as Belfast Central Station), runs eight times daily (five times on Sundays) and takes 2 hours 15 minutes http://www.translink.co.uk/Services/Enterpriseor www.irishrail.ie for the best value fares. Your Enterprise ticket includes free onward rail travel from Lanyon Station (previously known as Belfast Central Station) there is a free Metro Bus Service from Lanyon Station (previously known as Belfast Central Station) to the city centre (Belfast City Hall area). The Visit Belfast site has everything from 5 star hotels, guest houses, bed & breakfast and self-catering. How Can Lasers Beat Bacteria?